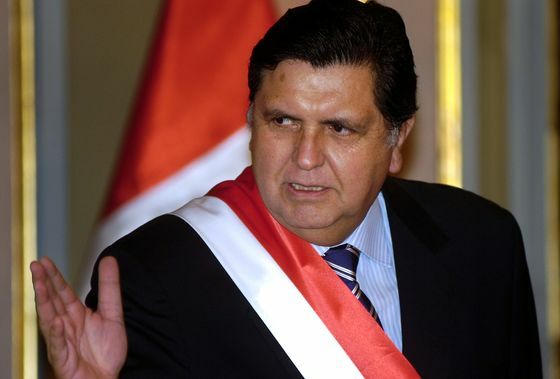 (Bloomberg) -- Former Peru President Alan Garcia’s suicide with police at his door Wednesday was a deadly turn in an aggressive continental corruption probe that has ensnared four of the nation’s former leaders. The dramatic death of the longtime leftist underscores the scope of the Odebrecht affair, which has spawned bribery probes across Latin America and destabilized governments, above all in Peru. The Andean nation has endured grinding poverty and a stubborn Maoist insurgency. Its reckoning with graft at the highest levels could continue decades of dysfunction, or be a long first step toward cleaning up its government. Garcia, a towering 69-year-old nicknamed Crazy Horse, served as president twice, living in exile between his administrations after accusations of graft. He returned only after the statute of limitations expired. On Wednesday, he was facing the prospect of prison for the first time. President Martin Vizcarra, whom Garcia had blamed for the investigations, confirmed his death in a tweet. “My condolences to his family and loved ones,” he wrote. Garcia was Peru’s president between 1985 and 1990 and again from 2006 to 2011. A populist, he presided over an economic collapse in his first term before embracing free-market policies in his second term, and the country enjoyed rapid growth. But he was swept up in the Odebrecht scandal and investigators believed he had been bought off by the Brazilian construction giant. Garcia unsuccessfully sought asylum in the Uruguayan Embassy in November after a court barred him from leaving the country for 18 months during the investigation of a rail contract Odebrecht won during his second administration. This next day, prosecutors and police came to his Lima home. Garcia went into his bedroom on the second floor, saying he was going to call his lawyer, said Interior Minister Carlos Moran. A few minutes later a shot was heard. Garcia was taken to the hospital at 6:40 a.m. local time and underwent surgery, Health Minister Zulema Tomas told reporters after visiting the emergency room. Garcia received cardiopulmonary resuscitation three times, she said. Probes into campaign donations and bribes Odebrecht paid have embroiled the country’s executive and stalled major infrastructure projects, slowing its economy. The investigation, dubbed Operation Carwash, started in Brazil and has also ensnared members of the business and political elite in that nation, the region’s biggest economy. Michel Temer last month became the second former Brazilian president to be arrested as part of Carwash. The company has admitted to bribing officials across Latin America and in 2016 agreed to pay the largest corruption penalty ever levied by global authorities. The scandal dealt a heavy blow to impunity that prevailed in the region for so long, said Thomaz Favaro, a Sao-Paulo based director at Control Risks, a consulting firm. Peru’s iteration of the Odebrecht probe may gone deeper than that of any other nation, he said. Authorities there have barred former President Ollanta Humala from leaving the country, and the government is seeking the extradition of former President Alejandro Toledo from the U.S. A court last week ordered the detention of former President Pedro Pablo Kuczynski for 10 days. Prosecutors have requested a separate court order to jail Kuczynski for 36 months as they prepare laundering charges. He has denied wrongdoing. Garcia’s ascent to the presidency, and his fall, came after a lifetime in the public eye. Alan Gabriel Ludwig Garcia Perez was born in Lima and became involved in politics from an early age. He accompanied his parents to meetings of the American Popular Revolutionary Alliance party, a center-left party founded in Mexico with aspirations of becoming a continental movement. A gifted orator, Garcia trained as a lawyer in Lima and Madrid. At 35, when he was first elected, he was South America’s youngest leader, and was dubbed Peru’s John F. Kennedy. His first term was defined by the Latin American debt crisis, as governments across the region struggled with public debt and inflation. During that administration, the economy contracted 20 percent and national reserves plummeted. Garcia imposed a limit on debt payments equal to 10 percent of the economy, which isolated Peru from the international finance community. Inflation reached 7,650 percent in 1990 as Garcia’s successor, Alberto Fujimori, removed price controls and replaced the currency. After his presidency, Garcia went into exile in Colombia and later, France. He returned to Peru in 2001 after Fujimori’s government collapsed, and was runner up in that year’s election. He ran again in 2006 and won a runoff against Humala, who would succeed him in 2011. No Latin American economy grew more than Peru since 2001 to 2010, with GDP jumping 73 percent, thanks to a commodities boom that spurred construction of new mines and turned Peru into the second-biggest copper producer. Under Garcia, Peru created 2.5 million jobs and increased annual per capita GDP by 54 percent. He took the decision to move full speed ahead with projects to develop Peru’s natural resources, taking a dim view on opposition by local communities. Garcia oversaw the signing of free trade agreements with China and the European Union, while forging close ties with regional leaders, including Brazil’s former President Luiz Inacio Lula da Silva. Garcia proposed the creation of a free trade area between Peru, Chile, Colombia and Mexico in 2011, which later became known as the Pacific Alliance. When Garcia left office for the last time, he had a 42 percent approval rating -- exceptionally good by the nation’s standards. His suicide in the face of detention may force Peru to evaluate the widespread use of imprisonment before trial, said McClintock. “Latin American countries have been too corrupt for far too long but by the same token, we do have to respect the rights of the accused too,’’ she said. Late Wednesday afternoon, Vizcarra declared three days of mourning.